Montgomery County police have arrested and charged a suspect in the deadly assault of a woman outside St. Raphael's Catholic Church in Rockville last Friday evening. Kevin Justin McGuigan, 21, of the 10300 block of Grosvenor Place, has been charged with the first-degree murder of his mother, 49-year-old Jaclyn McGuigan, of Marwood Court in Rockville. Detectives allege McGuigan fatally wounded his mother around 6:00 PM outside of the church with an unidentified "cutting type of instrument." Witnesses who heard the victim's screams say they saw McGuigan standing over his mother, who was laying on the ground at that point, and then fleeing in a Honda sedan. Police found McGuigan's Honda abandoned at Falls Road Local Park forty minutes after the alleged assault took place. After obtaining an arrest warrant for McGuigan, County officers closed in on him at a Rockville gas station Saturday morning around 7:00 AM, successfully taking McGuigan into custody. 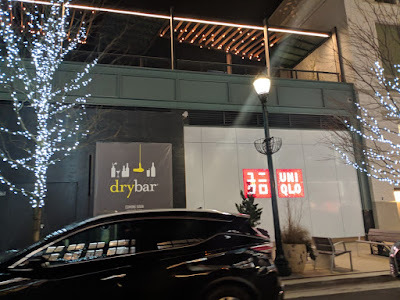 Blowout salon chain Drybar has posted Coming Soon signage at its future Pike & Rose storefront. The 1705 SF salon will open at 11861 Grand Park Avenue this coming spring. 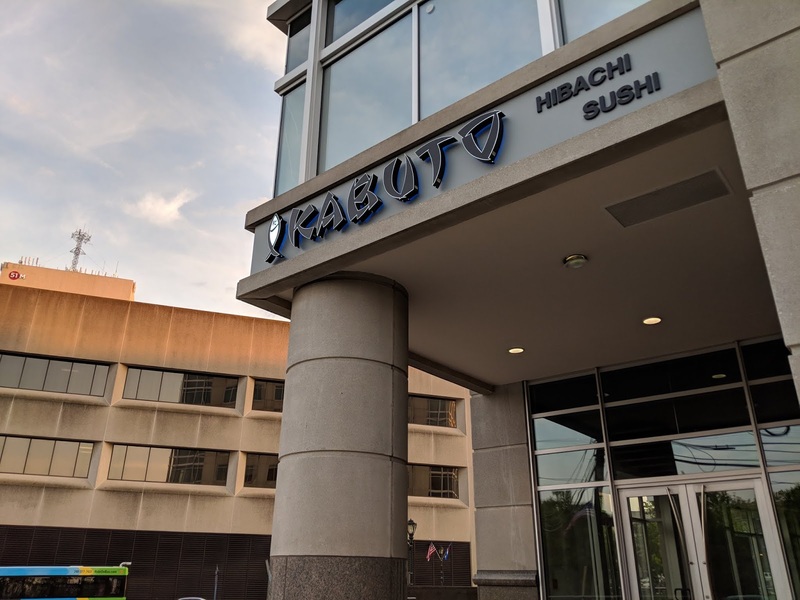 The long-awaited Kabuto Hibachi Grill & Sushi restaurant at 1 Choice Hotels Circle in Rockville is now open. Try something raw from the fresh sushi menu, or something hot made at your hibachi table - or both. As Rick Perry said, "Why not?!" Parking is free for four hours in the Rockville Metro Plaza parking garage, with validation from the restaurant. Call (301) 978-7923 to make a reservation. Rockville-based Choice Hotels International is expanding its brand in the Mid-Atlantic region, the company reports. It has opened its 40th Cambria Hotel-branded property in Hanover, Maryland. That hotel is targeting travelers using nearby BWI Airport, patrons of the Maryland Live! casino at Arundel Mills, and business travelers heading to Fort Meade. 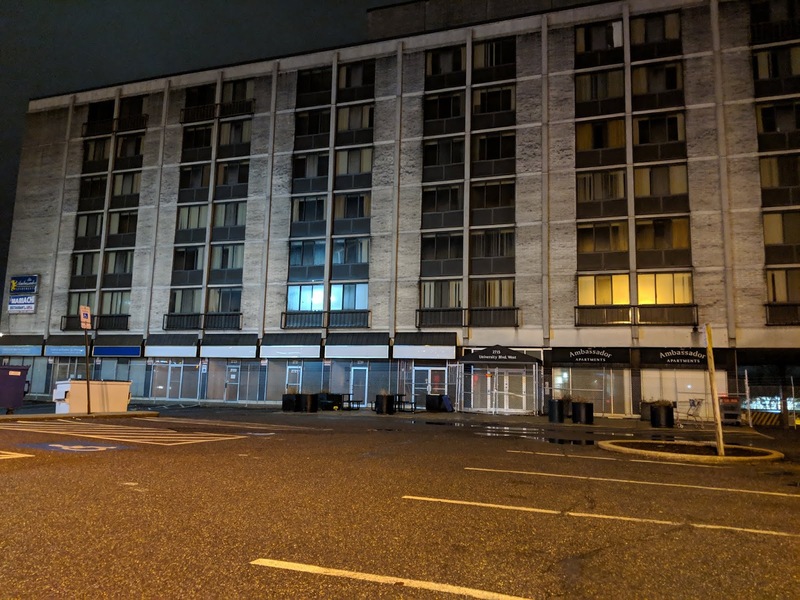 Choice has further plans for Cambria hotels in Ocean City, Baltimore, Capitol Heights and Southwest Washington, D.C. In addition, Choice has snapped up eight existing Mid-Atlantic hotels, and will convert them to Choice brands between now and early 2019. 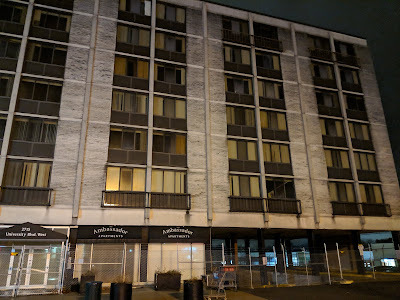 The hotels are located in Lancaster, Levittown and Lebanon, Pennsylvania; South Boston, Virginia; and Seaside Heights and Wildwood, New Jersey. 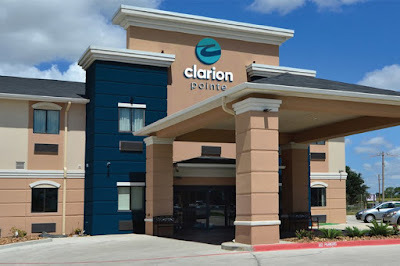 They will be converted to Choice's Clarion, Clarion Pointe, Quality Inn and Rodeway brands. 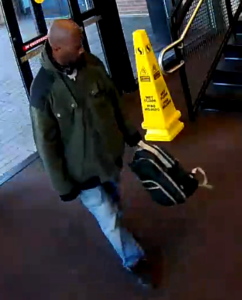 The suspect sought in the sexual assault of a 5-year-old girl at the Rockville Memorial Library is now in custody. 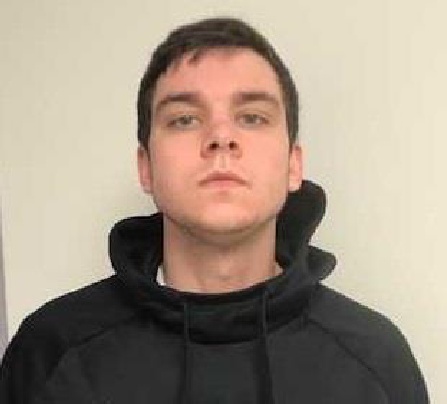 Montgomery County police have arrested and charged Keelan M. Sternklar, 26, of an unconfirmed address, for committing a third-degree sexual offense and second-degree assault in the December 15 incident. 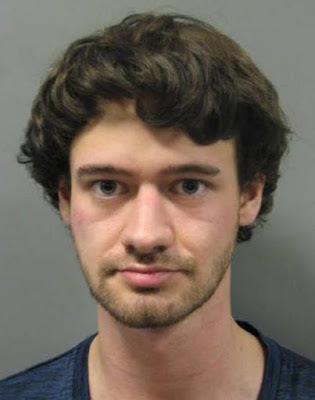 Sternklar was located by City of Rockville police in an unspecified coffee shop "approximately one block" from the library on Thursday around the same hour he had been spotted in the library days earlier. County police arrested him later at a homeless shelter on Crabbs Branch Way. Detectives report Sternklar has admitted he was in the library at the time of the alleged December 15 assault. 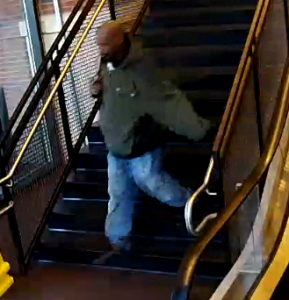 Montgomery County police have released surveillance photographs of the man they say is a "person of interest" in the alleged sexual assault of a five-year-old girl at the Rockville Memorial Library on December 15 around 6:00 PM. Anyone with information about this crime or information about the male in the photographs is asked to call detectives at 240-773-5448. Rockville's Ascentage Pharma has entered into a partnership with Chinese firm Genor Biopharma to research if combinations of their cancer inhibitor drugs would be more effective than as standalone products. The proposed research and therapies would target solid tumors and hematologic malignancies. 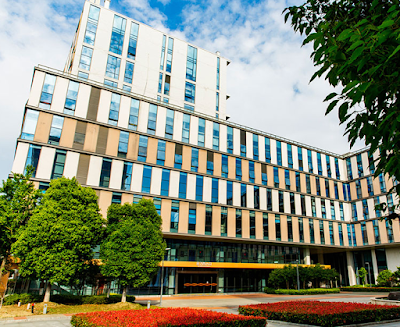 Ascentage itself is a Chinese firm with its U.S. office in Rockville, and is a global clinical-stage biopharmaceutical company. 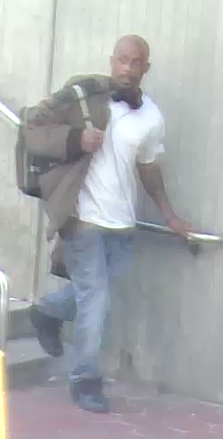 Montgomery County police detectives with the Special Victims Investigations Division have said that a 5-year-old girl was sexually assaulted by a man at the Rockville Memorial Library at 21 Maryland Avenue on Saturday, December 15 around 6:00 PM. 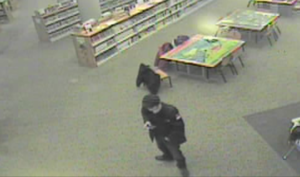 A suspect in the case has been identified in surveillance camera footage lingering in the childrens' section of the library for thirty minutes prior to the attack. When he did attack, police say, the suspect allegedly approached the victim, pulled down her pants, and touched her inappropriately. The victim screamed and told her parents what had happened. Detectives describe the suspect as a white male, with a possible thin goatee and a medium build. 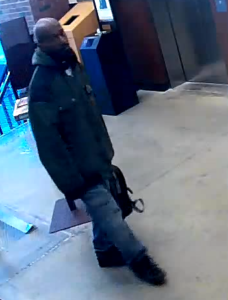 Anyone who was in the library on the date this incident occurred and observed any part of this incident or believes he/she may have information pertinent to this investigation is asked to call detectives at 240-773-5448. 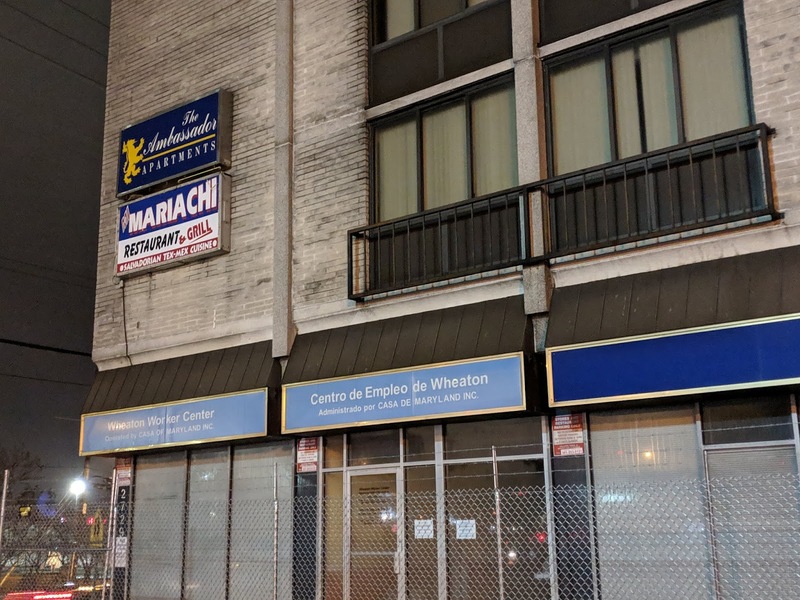 The stakes in a debate over school capacity standards were raised dramatically at a Mayor and Council worksession last night, as one of the developers currently facing a building moratorium declared their prize anchor tenant hangs in the balance. Todd Pearson, a Senior Vice-President with developer B.F. Saul told city leaders that grocer Wegmans will break the lease agreement they have at Saul's Twinbrook Quarter development if ground isn't broken by Q1 2020. Pearson prefaced his warning by saying, "This is not a threat by any means." But he noted that Wegmans is "the most highly-coveted retail tenant in the country," and has no shortage of suitors for their stores. Time is literally of the essence in regards to both the firm deadline, and the impatience of the Rochester-based grocery chain. 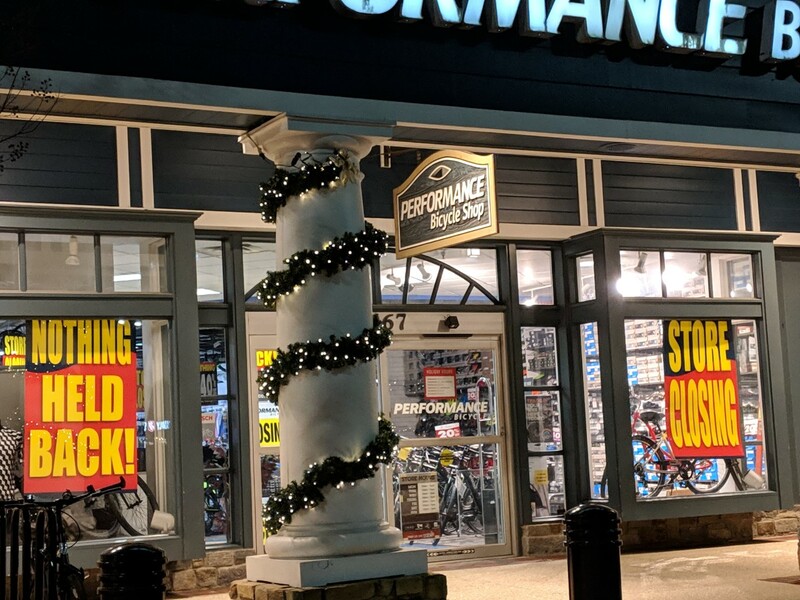 Wegmans chose the Twinbrook Quarter site, located at the corner of Rockville Pike and Halpine Road, because they had lost patience with Lerner's White Flint Mall redevelopment. When it was clear that Lerner was set on a protracted legal fight, Pearson said, Wegmans decided to go with B.F. Saul up the road. But if they don't get the time advantage they sought with a Q1 2020 start, "Wegmans walks from the lease," Pearson warned. Pearson also outlined the laundry list of items that must be achieved in the next year to facilitate a Q1 2020 groundbreaking, including approval of its delayed Project Plan and Site Plan by the Planning Commission, and utility cutoffs and receipt of the necessary permits from the City. Any delay beyond the end of January for the school capacity decision could potentially deep-six the already-tight schedule, Pearson said. "Unfortunately, that timeline has shortened," Pearson told the Mayor and Council. "We are highly concerned." Mayor Bridget Donnell Newton expressed hope that a longer deliberation on the controversial topic of school overcrowding could be held, with the City streamlining the approval process for the project afterword. City staff confirmed that the Planning Commission could begin its approval process in January, but commissioners would not be able to vote on it without a vote by the Mayor and Council to loosen the school capacity standard. Officials held an extensive debate on how to move forward. 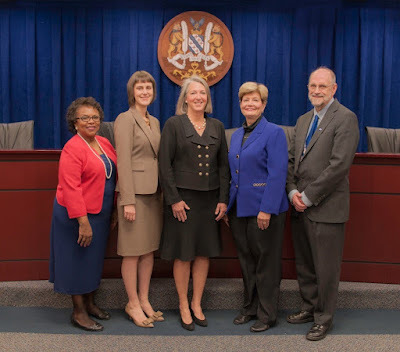 Newton asked Montgomery County Public Schools' Director of Capital Planning Adrienne Karamihas if the City would actually get a new addition or new high school if it loosens its overcrowding maximum from 120% to 150%. "I can't answer that question that way," Karamihas replied. Any new school would be unlikely to come online before the mid-2020s, she speculated. Councilmember Mark Pierzchala argued that the B.F. Saul project and two others in the Town Center area would not put Richard Montgomery at 150% by themselves. Councilmember Beryl Feinberg countered that several projects west of I-270 will also feed into Richard Montgomery, and must be taken into account. 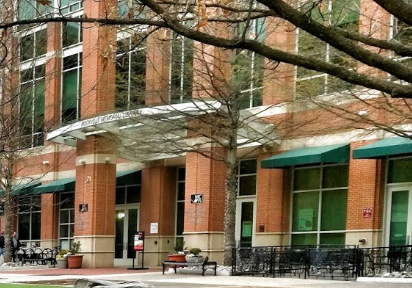 In the short term, however, any students generated by the initial phases of the Twinbrook Quarter project will be assigned to the Walter Johnson cluster in Bethesda. Newton expressed frustration at the framing of a "Wegmans versus education issue," and that she and the Council were not alerted to a letter from B.F. Saul sent to City staff last January regarding this very matter. Had they known then, she said, a more deliberate process could have been undertaken without threatening the Wegmans deadline. "I'm trying to make a silk purse out of a sow's ear," Newton said. Options she would like to examine before voting to change the APFS on school capacity include whether a new high school upcounty or planned redistricting would provide the capacity needed for the Twinbrook Quarter project. The Mayor and Council, after consulting with B.F. Saul on their timeline, ultimately decided to extend the decision period until January 28. A January 7 public hearing on the APFS question was canceled, and rescheduled for January 14. The final vote will be held at the January 28 meeting. Residents and civic association leaders from the West End, East Rockville and Twinbrook addressed the Mayor and Council during the Community Forum earlier in the meeting, and the vast majority opposed loosening school overcrowding standards. 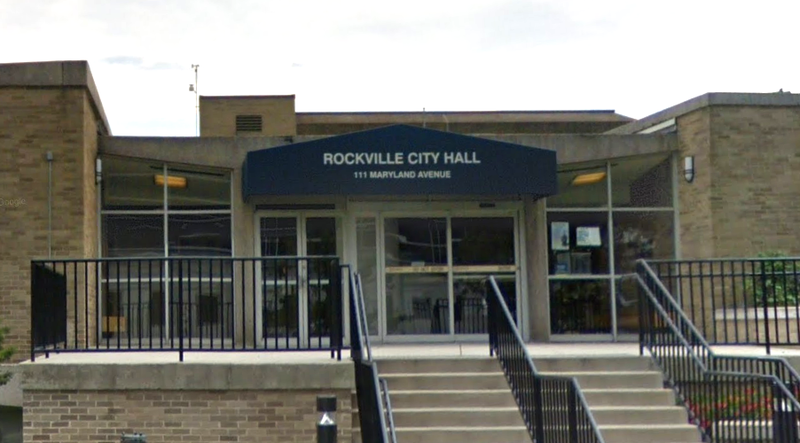 "What does Rockville stand for, and who is running the city?" asked resident Jack Gelin, who exhorted the Mayor and Council to "gain control of the city" back from whoever is driving the growth debate now. "Are we going to go from 'bad' to 'even worse'?" one parent of Richard Montgomery cluster students asked. Pressure from the other side is equally strong, as City officials attempt to deliver Twinbrook Quarter, which they have designated a "champion project." 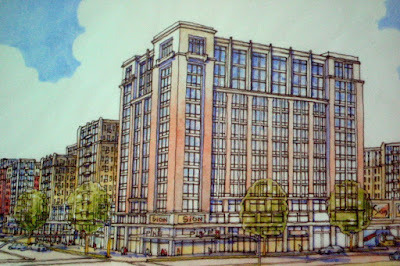 Most of the excitement about that project among the general public has been about the Wegmans. "Without school capacity, we can't move forward," Pearson said Monday night. The citizens of Montgomery County haven't asked Delegate Eric Luedtke (D - District 14) to make it harder for Republicans and progressive Democrats to run for the County Council. But cartel Democrats who swept the Council elections in November - and want to hold those seats for the next twelve years - have. As have their developer sugar daddies, who are still stinging from the only race they lost out of dozens, County Executive. Luedtke has quietly filed Bill MC 6-19 in Annapolis, which would require everyone seeking to run for the Council to collect 1000 signatures if running At-Large, or 250 signatures if running for the less-contested district seats. Such a change would strongly favor incumbent cartel Democrats, who don't want to have to compete in a large field with progressive Democrats not beholden to developers in 2022. And the cartel doesn't want truly progressive County Executive Marc Elrich to gain any allies on the Council in 2022, either. The change would also impact Republican candidates as well. Both progressive Democrat and GOP candidates would be discouraged from running for office, the clear intent of the legislation. The Luedtke bill goes strongly against the tide of his own party's stance on voting rights. While the trend outside of red states has been to make it easier to participate in the electoral process, Luedtke and the bill's backers actually want to make it tremendously more difficult for the average citizen to participate. In fact, Bill MC 6-19 would implement a throwback barrier to candidacy that has been used in other states to discourage African-Americans from running for office - a fake requirement of the free time and financial resources needed to collect 1000 signatures. Is this the Democratic Party in Montgomery County in 2018? Nancy Floreen is the prime example of why Luedtke and the cartel are trying to ram this bill through. Floreen, enjoying nearly $1 million in developer cash donations, was able to obtain thousands of signatures to qualify as an unaffiliated candidate for County Executive in 2018. She did not collect them herself; she hired signature collectors to storm the County. So, too, would the Council incumbents - and cartel-funded newcomers - be able to quickly get their 1000 signatures, without ever breaking a sweat themselves. Republicans and progressive Democrats? Not so much. 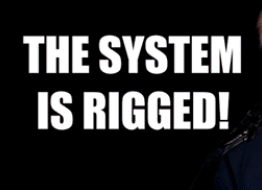 This is an outrageous attempt to limit the ability to run for public office to only the well-funded and well-connected, and to the sugar daddies who pull their puppet strings. It must be stopped. Contact your delegate by email or phone today, and tell them to vote against Bill MC 6-19 . 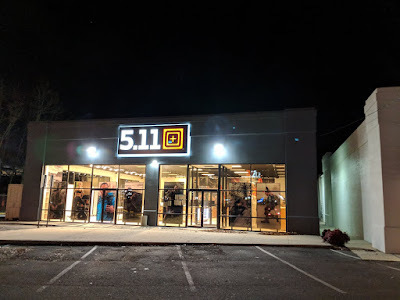 5.11 Tactical is now open at 12212 Rockville Pike. Carrying professional apparel and accessories for law enforcement personnel and preppers, they also cater to the fitness and outdoors market segments. With Montgomery County's crime rate surging, this could be a one stop shop for your Christmas list. legal advice and to consult with staff, consultants, or other individuals about pending or potential litigation." Then, during a special meeting at 10:30 AM on Thursday, December 20, they will adjourn to a closed session regarding "a matter that concerns the proposal for a business or industrial organization to locate, expand, or remain in the City." 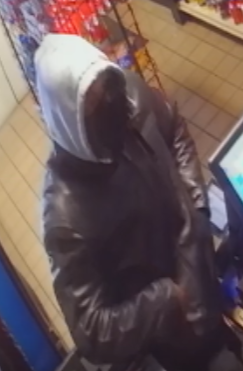 Montgomery County police are searching for a suspect they say robbed a gas station in Rockville on December 5, and have released surveillance footage of the man. Detectives allege the man entered the convenience store at the Exxon station located at 5500 Norbeck Road around 12:10 AM. They say he implied he had a gun, and demanded cash. The suspect allegedly then took the cash, grabbed some other merchandise, and then fled the scene. Anyone with information regarding the suspect or this robbery is asked to call the Major Crimes Division at 240-773-5070. Those who wish to remain anonymous may call Crime Solvers of Montgomery County toll-free at 1-866-411-TIPS (8477). Crime Solvers will pay a cash reward of up to $10,000 for information provided to them that leads to an arrest in this case. The "Everything Must Go!" and "Nothing held back!" 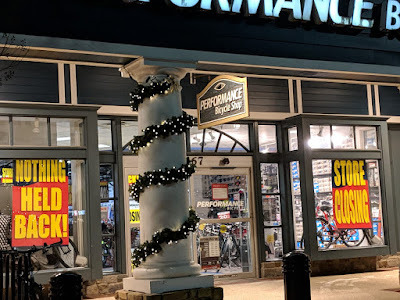 going-out-of-business signs that have become so ubiquitous in moribund Montgomery County have popped up at Congressional Plaza on Rockville Pike. 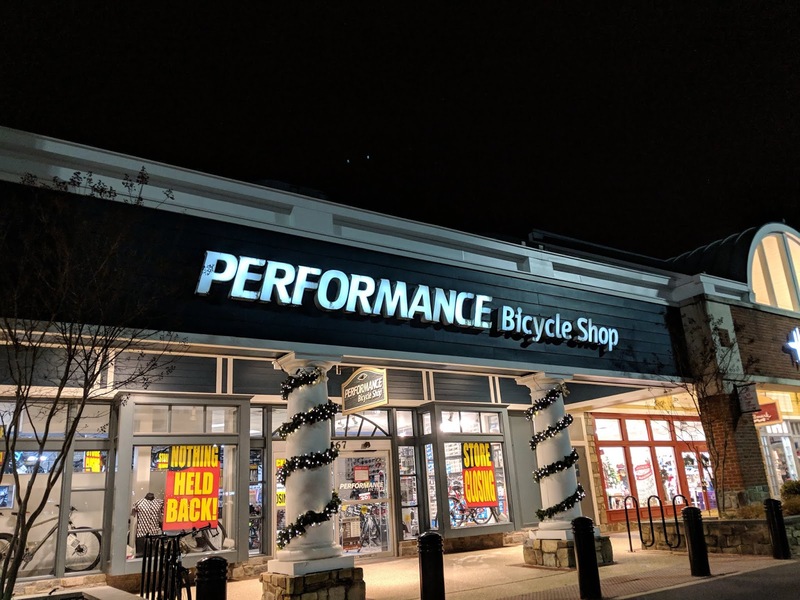 Performance Bicycle Shop is the latest victim. The store is holding a closing sale with prices up to 40% off. 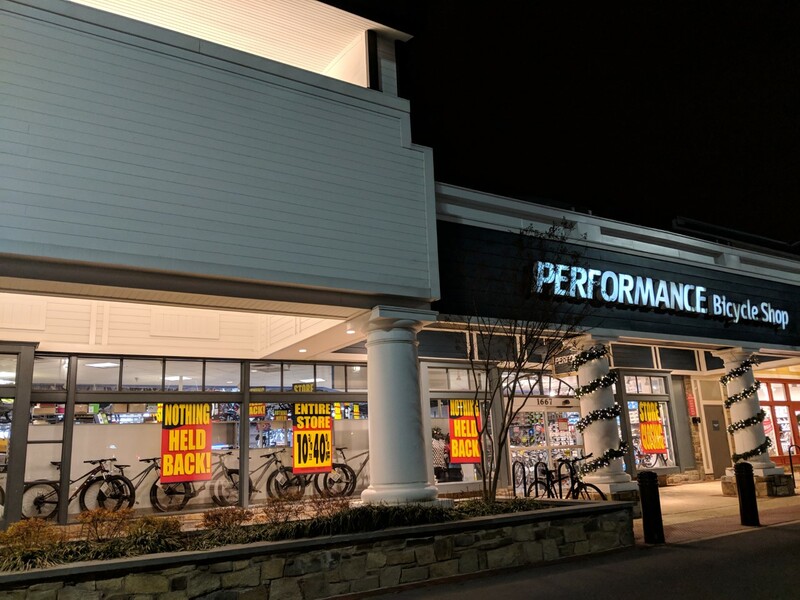 Montgomery County has suffered a net loss of more than 2100 retail jobs since 2000, according to the Maryland Retailers Association. Another hot pot restaurant is coming to Rockville. Hot Pot City will be opening soon at 199 E Montgomery Avenue at Regal Row in Rockville Town Center. The owners are touting the hot pot tradition of the river city Chongqinq in southwest China. It first was popular during the late Ming and early Qing dynasties, they say. The space was formerly home to Tara Asia, and is very convenient to the busy courthouses and government buildings in Town Center. 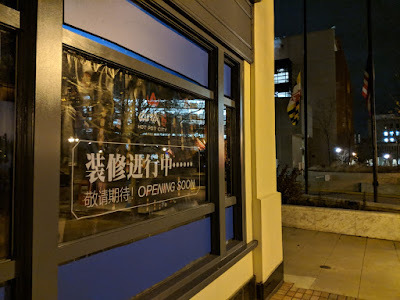 Here is another notch in Rockville's belt as a leading destination for Asian cuisine in the D.C. region, arguably second only to Annandale, and I feel like we're going to take the top spot any week now. 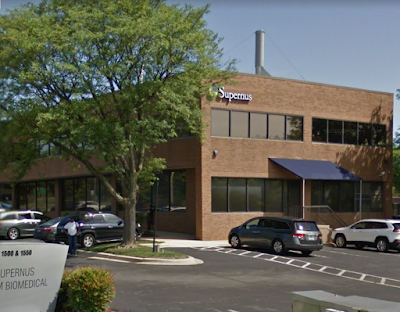 Rockville-based Supernus Pharmaceuticals, Inc. had a good news-bad news Thursday. The company received the key positive results they had hoped for from two trials of their SPN-812 drug, designed to treat ADHD in children. Study results showed that the Supernus formula acts faster and has fewer side effects than the existing generic options. But industry analysts declared the drug was still not superior enough to the two generics on the market to differentiate itself, and shares in Supernus fell almost 16% yesterday. The company says it remains optimistic that the small number of treatment options available still gives their product a niche in the market. “We believe these data from the two pivotal Phase III studies, which are consistent with the Phase IIb data, demonstrate that SPN-812 is a well-differentiated novel non-stimulant treatment option for many children with ADHD," Supernus CEO Jack Khattar said Thursday. 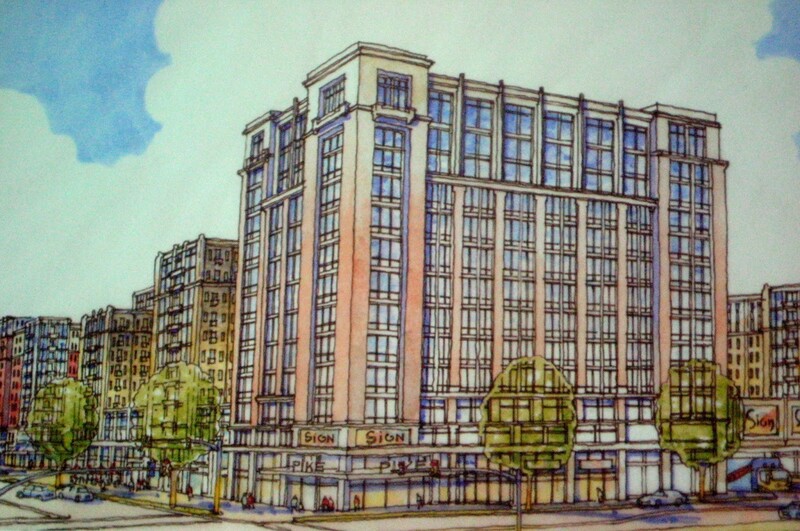 With affordable units vacant in Rockville & countywide, does MoCo really have a housing "crisis?" How serious is the affordable housing "crisis" in Montgomery County? 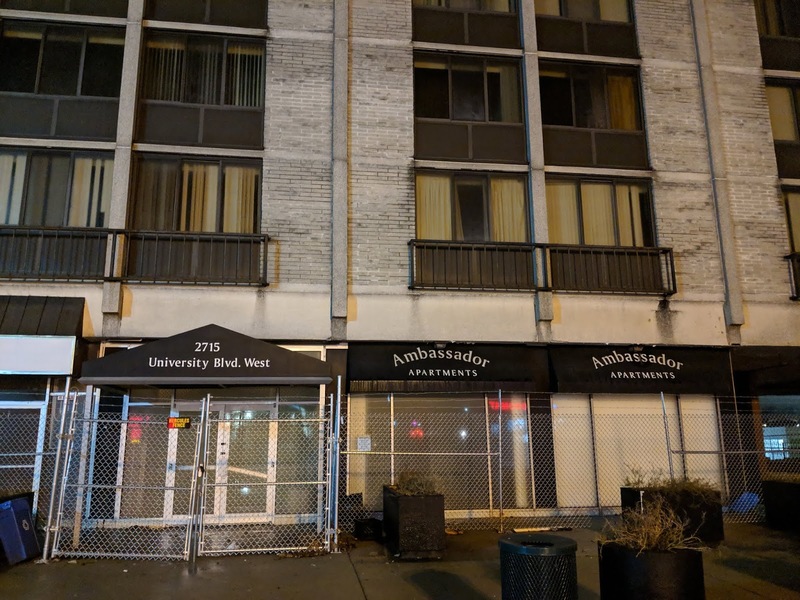 We've been hearing off-and-on about the Montgomery County Housing Opportunities Commission's development plans for the Ambassador Apartments in Wheaton since 2012. At one point, it was said that a new building would be constructed on another part of the property, allowing current residents of the Ambassador to remain in their homes. But now, the building - a former Best Western hotel at the corner of Veirs Mill Road and University Boulevard - has been shut down and fenced off. Businesses in the ground floor have also been vacated. Residents have supposedly been relocated by the HOC to other properties around the county. However, the HOC declined to respond to media inquiries made earlier this week by press time. From what I can find in County documents, it appears the building will be demolished at a cost of up to $1.5 million, a cost that will be picked up by County taxpayers. HOC has previously requested the funds from the County Council for that purpose. 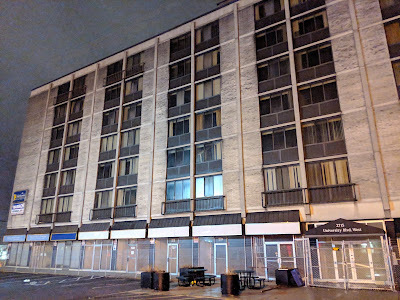 Demolition was to have begun this year, and construction of the new development was to break ground in 2019. It appears that would still be possible if demolition occurs soon. 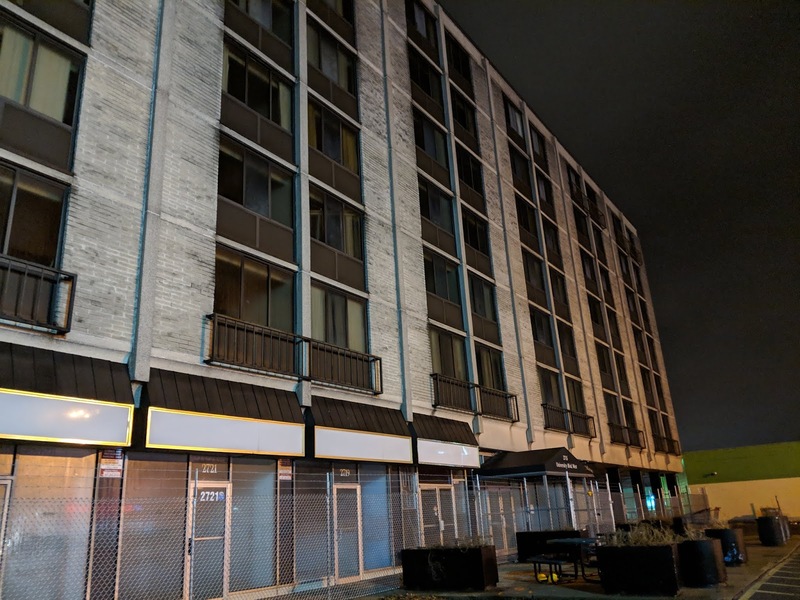 The loss of 162 low-income housing units near Metro - and the apparent ability of the HOC to find that many vacant units for the departing tenants - raises questions about just how serious the affordable housing "crisis" is in Montgomery County. Last year, the owners of Halpine View in Rockville off Veirs Mill Road stated that demand for their affordable apartments was declining, and that they had a substantial number of vacancies. Beggars cannot be choosers, as they say. A modest, older apartment at Halpine View or the Ambassador would beat being homeless any day of the week. There should not be vacancies at Halpine View, and it should not have been possible to find vacant homes for 162 families before closing the Ambassador. Dogged apartment hunters would surely have found these affordable gems in their desperate housing searches. What is going on here? County residents are being told we must now throw traditional, common-sense zoning rules out the window to address a housing "crisis," a move that will destroy existing single-family home neighborhoods. It appears further study of just what is going on here is clearly needed before making such irresponsible planning and fiscal decisions, especially with the County facing a structural budget deficit every year as far out at the forecasts go. More transparency is also needed. How many vacant affordable apartments are there countywide as of today? Taxpayers and homeowners deserve to know before accepting the new onerous costs, and reduced quality of life, that would come with adding multifamily urban housing within residential SFH neighborhoods. 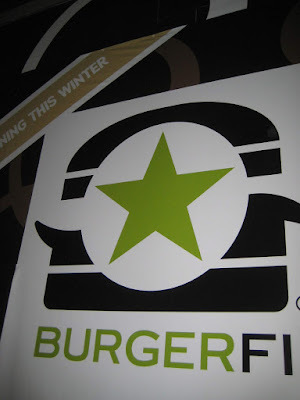 Construction has begun at the future BurgerFi restaurant at Pike & Rose. 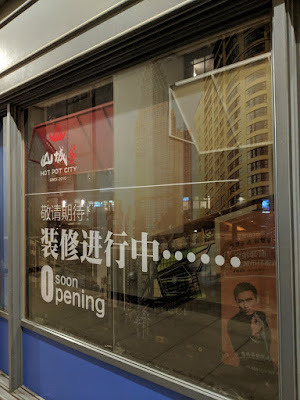 The large "coming soon" signage was moved aside to allow access to the construction entrance when I went by this week. I had not seen any activity there previously. Montgomery County police detectives have released photos of a man they accuse of shoplifting and assault of an employee at the Twinbrook Safeway store, located at 1800 Rockville Pike, on October 17 around 1:00 PM. Detectives say the suspect stuffed merchandise from the Safeway's shelves into a bookbag, and then attempted to walk out of the store without paying for any of it. 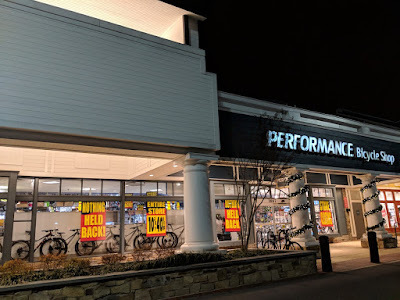 Confronted by a "loss prevention employee" as he left, the suspect allegedly then pulled a knife out of his back pocket, and pointed it at the chest of the employee. 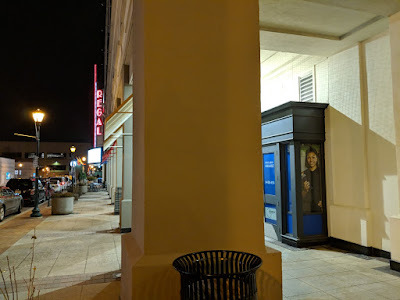 The suspect was able to then flee the store, and was last seen boarding a Metro train at the Twinbrook Metro station nearby. Anyone with information about this theft and first-degree assault and/or the suspect involved is asked to call the 1st District Investigative Section at 240-773-6084. 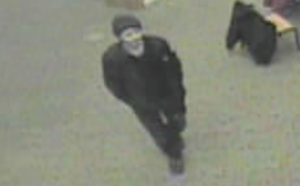 Those who wish to remain anonymous may call Crime Solvers of Montgomery County toll-free at 1-866-411-TIPS (8477). Crime Solvers will pay a cash reward of up to $10,000 for information provided to them that leads to an arrest in this case.